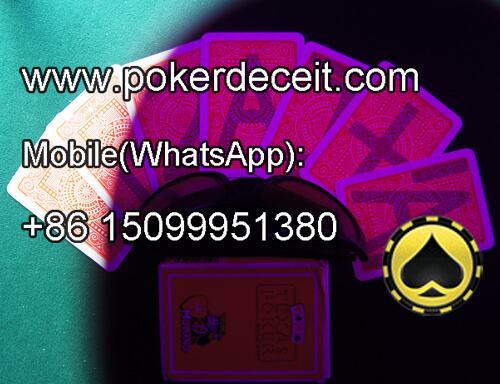 There are Modiano invisible ink marked cards and Modiano barcode marked cards for sale in our company, both of them can bring a lot of benefit for you in different poker games. Here, we will introduce the barcode Modiano marked decks. We process the imported Modiano poker to be best marked deck with the best invisible ink for playing cards, professional marked cards printer. There are different invisible ink barcode marks on the edges of each piece of barcode playing card. These barcode poker cards can be read by poker scanner, such as lighter poker camera, water bottle poker scanner camera, ashtray poker camera lens. After scanned by these poker scanning camera, their information will be sent to poker hand analyzers for calculating the playing card games outcome, like CVK poker 500 poker analyzer, AKK playing cards analyzer, PK king poker predictor and others. You can use this Modiano marked poker cards in various kinds of poker games. And if you interested, we also have the best marked cards Modiano for marked playing cards contact lenses as well as infrared sunglasses for marked decks for sale.